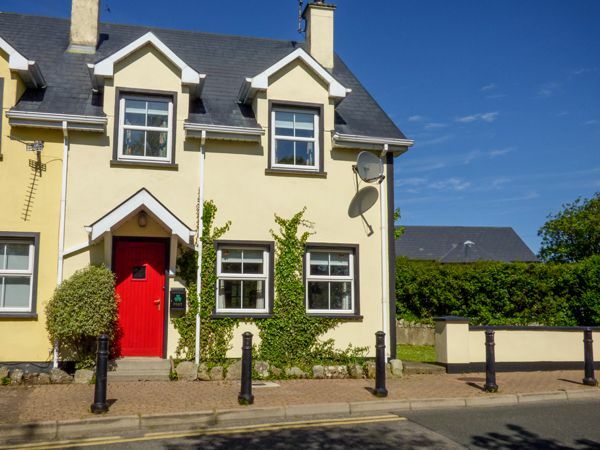 No 17 Mountain Dale is a lovely end-terrace cottage set in the village of Tullagan, close to the seaside town of Bundoran on the borders of County Leitrim and Donegal. This cottage sleeps seven people and has four bedrooms consisting of three double beds, one of which has an en-suite shower cubicle and one single, as well as a family bathroom. The rest of the cottage is made up of a fitted kitchen with dining area and a sitting room with open fire. To the outside of this cottage there is roadside parking on a first come, first served basis and a lawned garden to the side and rear with furniture. No 17 Mountain Dale is a superb holiday home for friends and families in an area that has plenty to see and do. Amenities: Oil central heating with open fire in sitting room. Electric oven and hob, microwave, fridge/freezer, washer/dryer, TV, DVD, video, CD/radio, selection of books, games, videos and CDs. First 20 of fuel and power inc. in rent, rest on meter reading. Fuel for open fire inc. in rent. Bed linen and towels inc. in rent. Cot and highchair available. Roadside parking on a first come, first served basis. Lawned garden to rear and side with furniture. Three well-behaved pets welcome. Sorry, no smoking. Shop and pub 1 min walk. Note: Property fronts onto a country road and as such, children should be supervised. Four bedrooms: 3 x double, one with en-suite shower, basin and WC, 1 x single. Bathroom with bath, shower over, basin and WC. Ground floor basin and WC. Fitted kitchen with dining area (seats 6). Sitting room (seats 5) with open fire. Oil central heating with open fire in sitting room. Electric oven and hob, microwave, fridge/freezer, washer/dryer, TV, DVD, video, CD/radio, selection of books, games, videos and CDs. First €20 of fuel and power inc. in rent, rest on meter reading. Fuel for open fire inc. in rent. Bed linen and towels inc. in rent. Cot and highchair available. Roadside parking on a first come, first served basis. Lawned garden to rear and side with furniture. Three well-behaved pets welcome. Sorry, no smoking. Shop and pub 1 min walk. Note: Property fronts onto a country road and as such, children should be supervised.